While my head is down in editorial work – Teesside Archaeological Society’s annual Bulletin journal with 70 pages of regional wonder and CBA Yorkshire’s FORUM YORKSHIRE archaeological journal volume 3, my last as editor – I came across the AHRC-funded project “Neolithic Stepping Stones”, June 2011 to September 2014. Another outcome of the project is a book co-authored by Dr Garrow, Dr Sturt and post-doctoral researcher Dr Hugo Anderson-Whymark. ‘Continental connections: exploring cross-channel relationships from the Mesolithic to the Iron Age’ (Oxbow) will be published by March 2015. 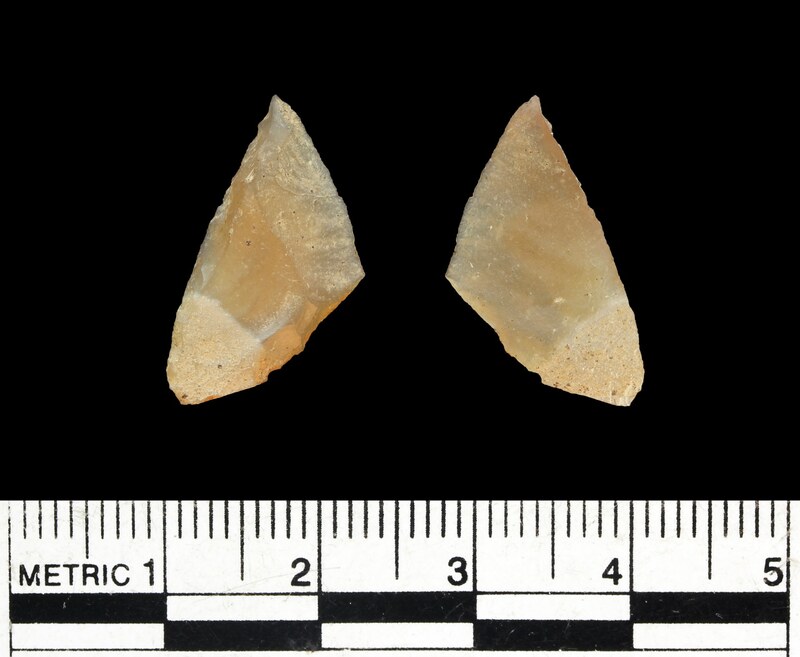 One of the 57 Mesolithic microliths found at Old Quay in 2013 (photo: Hugo Anderson-Whymark). The team have also produced a series of web resources drawing on the research, including a western seaways navigation game that works within Google Earth. And they used social media throughout the project – having such geographically dispersed participants made Twitter the perfect way to transmit updates. Microburin’s Sites and Finds page has also been updated. This entry was posted in British archaeology, Hunter-gatherer-fisher, Mesolithic, Sites and finds and tagged Scilly by Spencer Carter. Bookmark the permalink.